Holdin it steady at Core Pilates NYC. Before triathlons and even marathons entered my life, I was a fitness-class junkie. I spent many hours leaning on a barre, jumping on a box, and bootcampin’ my behind around New York City trying every fitness craze I could. That was a few years ago and man has the scene exploded and expanded so quickly. I remember spinning at SoulCycle in a tiny back room studio with only a few other riders. Now, people anxiously wait at their computers when bikes open up on Monday afternoons. TRX got us like whoa. I haven’t really stepped foot in many studios since I started my triathlon journey, and that’s because a) there’s no time, and b) I can’t afford to hurt myself or set myself back with sore muscles. It’s a stinker because sometimes I do want to try what my friends are all raving about; I feel like I have so much to catch up on! It’s the excitement of it all that gets me. Everyday, I could be changing it up and Crossfitting here and Barry’s Bootcamping it there, but I’m living that swim, bike, run life now….and I am actually very happy about that. Well, I bring this all up because I did just the opposite of what I am supposed to do right now. No, I didn’t just take one class outside of training, I took THREE…IN A ROW! This is also known as a fitness crawl. The sound of it actually excites me greatly, but the affects it had on my body…well, let’s just say, OY VEY. Last weekend, I actually skipped a computrainer class on a Saturday to do said fitness crawl with two of my girlfriends, Amanda and Emily. The company that puts them together is Ketanga Fitness, a fairly new venture founded by two fitness and travel-lovin’ gals that wanted to combine the two through fit-cations around the world. We got to be part of the first-ever “Ketanga Krawl,” which was designed to allow a few dozen or so women (and men!) to studio hop in a specific city that’s crawling with fit trends. Each class lasts about 30 minutes and it ends with some refreshments and goodies. Plus, you get to hang with like-minded, fit fam members and you’re not the only one taking fit pics left and right. My people! hehe. GO TEAM at Tone House. 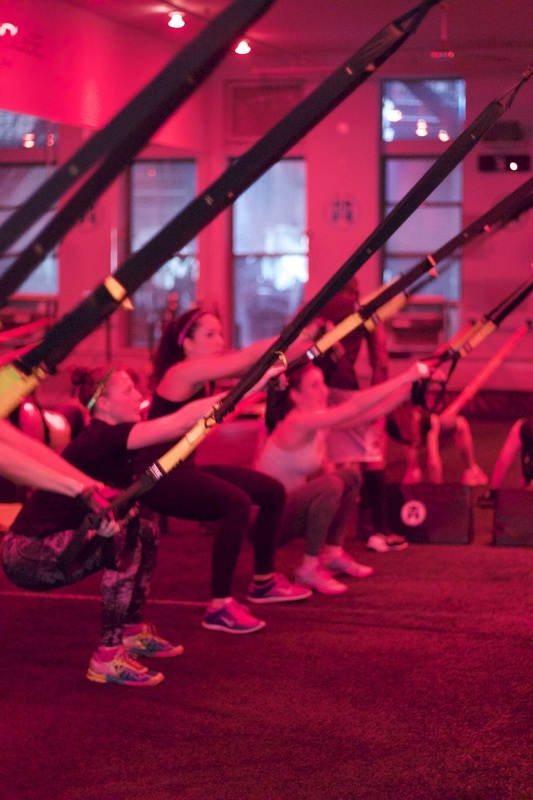 Last Saturday’s adventure was in NYC’s Union Square area and we kicked things off with Core Pilates NYC. I had completed one of my two computrainer classes (I tried to squeeze that in because I wanted to ride on my new tri bike) and then actually showered quickly (stinky B!) before heading to Pilates. It was the kind of class I needed - mixing up some stretching and core work and allowing me to enjoy some quiet mat time. Those little movements sure do have a way of sculpting the bod though - whoa! Pilates isn’t my favorite type of exercise, but I greatly appreciate its focus on achieving a strong, lean physique. After class, we all put our shoes and jackets back on and walked on over to studio #2 - Tone House NYC, an athletic-based group fitness class that seeks to “unleash your inner athlete.” TOTALLY my speed. I walked in ready for some action! We did a lot of drill work, focused on agility, strength and speed. From bungee cords to TRX to plyometrics, we were sweating our faces off and digging deep to find whatever it is we had inside to give. I found that I had to modify a lot due to my right arm tendonitis, because we spend a lot of time on our hands. I am not surprised that this place is packed on a regular basis. And they just celebrated their 1-year anniversary. Major congrats to them - I think it’s one of my favorite studios in Manhattan. If I had the time, strength, and/or funds, I’d be there a lot more often. I love any place that’s all about teamwork and making people feel good about themselves. Positive re-inforcement wins every time! Emily, Amanda and I...the winning squad! After Tone House, I felt I had lost 2lbs in sweat and I couldn’t imagine how I’d do at studio #3. Of all studios to end with, we ended with the hardest in my opinion- Crossfit Union Square. I have done Crossfit once before…just once…and I walked away very hurt from doing burpees, pushups, sit ups and squats - AMRAP style for 10 minutes (as many reps as possible). My legs were fine, but I couldn’t touch my hands to my head or even move them the slightest for almost 10 painfully excruciating days. I almost saw a doc, but could’t even raise my hand to hail a cab. HA! Anyway, here I am 1.5 years later and I’m giving it a go again. I admire these guys and gals that do it; I actually love watching the Crossfit Games. I just personally don't think it's the right fit for me on a regular basis. Anyway, we did plenty of squats with resistance bands and then broke into teams of three to partake in a little competition. Uh-oh. I am slightly competitive so whatever it is they were about to tell me to do, I would do at my absolute best, even if it hurt. (Now you see why I get hurt). The teams rowed on rowers, held kettlebells and did burpee box jumps non-stop for 10-minutes. Here we go again, I thought. But I burpee box-jumped my way through hell, and when the buzzer sounded, our team had done the most - 118 burpee box jumps! WHOA MAMA! Accomplishment set in…and then…so did stiffness. I felt the sore arms coming on but I ignored them as I slurped the yummy smoothies we were given and wiped my sweat off the floor. I remember thinking…my coach is going to kill me. Sure enough, even though I took extra measures to stretch, roll, refuel, medicate, ice, etc etc, I woke up Sunday morning with arms that wouldn’t move. AND I had to meet my teammates for a 9-mile run in the park. Of course I showed up and I sucked it up but I certainly didn’t make it to swim practice Sunday night. One workout down. And now its been just about 5 days and I still need assistance putting on my jacket. Such a bummer. BUT it’s my own fault for pushing myself too hard. I knew I needed to be careful but I would rather be competitive and that just needs to settle a bit. Anyway, a big shout out to Ketanga Fitness for an awesome Ketanga Fitness Krawl. For $30, I got to experience three great fit facilities, when one alone can cost about that price. For any of you looking for this experience, check them out! The next NYC Ketanga Krawl will take place on April 18th in the Chelsea area. Studios involved: Flex, Body Space Fitness, and the 3rd is TBA! More info HERE! I’ll still try and sneak in some boutique love where I can, but I gotta keep it light and remember that my goals are specific so I must not fall off track. A little lifting never hurt anybody, but being one-third of 118 burpees may be a little CRAY for this little lady. What new studios have you visited lately? I’d love to hear from you, and vicariously live through your adventures! P.S. - Tomorrow we're cycling outside as a team for the first time in 2015! Mother nature, you better keep us in your warm thoughts! I'm almost two weeks away from my first triathlon of the season (South Beach Tri) and this outside ride time is just what we need before the big day is finally here.